Having been recruited through LinkedIn, Andrew tells us about the importance of a placement year and presenting your CV in the best way possible. A recruiter found me through LinkedIn and I was offered a job with ORLA as a Clinical Administrator straight after finishing my degree. Then, after four months, I was offered a position in ORLA’s new graduate management scheme, which lasts for two years. The scheme is designed to provide me with a sound introduction to management and operations within the organisation. I was drawn to Psychology because I was always fascinated by how people think. When I began my studies, I quickly realised that as a subject it has an incredibly diverse range of applications thanks to its capacity to teach you about everything from individual health to group dynamics – not to mention a healthy dose of research methods and statistics! Psychology can pave the way to pretty much any sector or industry. I chose optional modules in Occupational Psychology during final year because I knew I wanted to develop into a management role. Within a small and relatively new company you can rise fast and face big challenges early on. Within six months I went from being the interviewee for an administration post to interviewing for my replacement, having to give the bad news to unsuccessful candidates as well as the much more pleasant experience of offering people the job. The level of responsibility I have now is incredibly challenging, but also very motivating. I project managed an office move for our entire clinical team at the hospital, which is a challenge for a 24/7 healthcare service that can’t just pause clinical operations. There was a great deal of preparation involved, but on the day everything went smoothly and the team all really pulled together to make it work well. I enjoy working on projects with large diverse teams of people who all bring different skills and backgrounds to the table. It’s all about standing out in any way you can; often a degree is not enough these days, so get experience – even if that means volunteering for free. My unpaid placement year was one of the best decisions I could possibly have made for my career. Having now experienced selecting interview candidates, I would also highly recommend putting time and effort into the appearance of your CV. We receive over 60 applications for any administration role, and applicants with nice CVs who tailor it to the job and company stand out. Plymouth gave me the ability to do an exchange year at Acadia University in Canada. This helped me to stand out when applying for placements during the optional placement year. 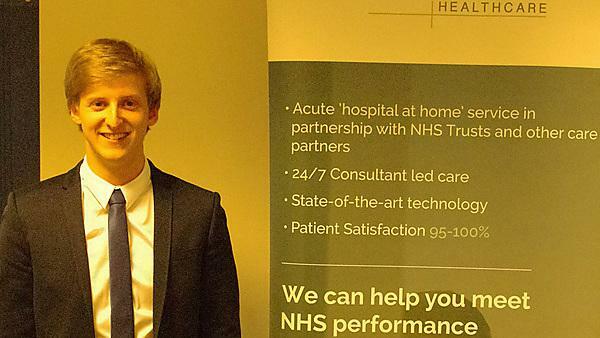 I was fortunate enough to get a placement at The National Hospital of Neurology and Neurosurgery, an experience which drew me into the world of healthcare – a sector within which I have progressed ever since! To name but a few: the ability to form a balanced and cohesive written argument, an understanding of how to tackle the process of analysing data (even if you can’t remember the statistic), and an appreciation of the many factors and influences involved in how people think and interact. Nothing cements your learning like actually going out and using it. I came into my final year far more prepared to handle the stresses and strains of exams and coursework because I felt I actually knew my stuff: it wasn’t just theory anymore. I also used work from my placement to complete my dissertation, which certainly took the pressure off from having to run experiments! It was the perfect placement for me and is easily one of the best decisions I have ever made. Plymouth is a great city in which to study and that led to many great memories from my time there: bar crawls and beach barbeques are just a few such memories. There’s tons of stuff to do and get involved in. Personally, my favourite memories will always come from spending time with friends and housemates, be it summery days on the Hoe, cramming sessions in the library, or late night conversations: your friends are what make any place special. Plymouth University has grown hugely as an institution during my time there. It has gone from strength to strength by investing heavily in the facilities and by providing as many opportunities as possible. I would wholeheartedly recommend studying there, regardless of what field you are interested in. It is a strong academic institution within a fantastic city and surrounding countryside. There’s something for everyone. 1. I like working with diverse teams of people. 2. I enjoy problem solving tasks. 3. I want to believe in the overall goals of the organisation I work for. Healthcare management ticks all three of these boxes for me, particularly within ORLA. Figure out what it is that you want to get out of a job and then find out how best to get into that sector and make yourself stand out.